Disney Frozen Logo Print T-Shirt age 2 years. Girls Disney Frozen Elsa & Anna T Shirt. The main colour of the t shirt is lovely multi coloured shades, This stunning t shirt has a crew neck & full length sleeves. The t shirt features a beautiful print of Elsa & Anna surrounded by snowflakes on the front. Disney Frozen Anna & Elsa Long Sleeved Grey Marl Cottton Top T-Shirt - BNWT! Anna & Elsa. Official Disney Frozen. Yellow Cotton T-shirt. ELSA T-SHIRT. DISNEY FROZEN. 100 % COTTON. 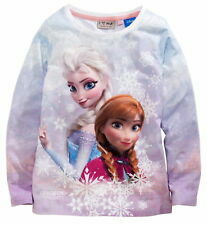 Disney Frozen, girls t Shirt with Anna and Elsa. White, size 10 Years. 100 percent cotton. FRONT SHOWS "BEAUTIFUL SISTERS" ELSA & ANNA WITH NAVY CIRCLE DECORATED WITH ICICLES & FLOWERS. LOVELY DISNEY "FROZEN SHORT SLEEVE TOP "BEAUTIFUL SISTERS" 5-6yr NEW/UNWORN. GREAT GIFT FOR YOUR FROZEN FAN. 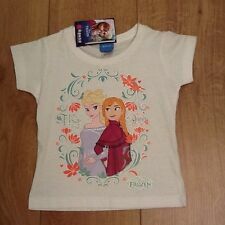 Very cute T-shirt with Elsa and Anna, Disney Frozen original. very comfy cotton. 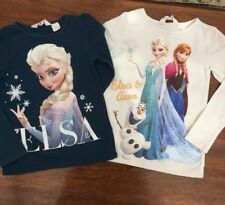 Girls Tshirts Tops X2 Disney Frozen Anna Elsa Age 6-7 Sequins . Condition is Used. Dispatched with Royal Mail 2nd Class. Anna Elsa Olaf. Large Frozen Print to the Front. Long Sleeved Top/T-Shirt. Light Blue in Colour. Wear and Care. Proceed to Checkout. Height 122-128cm. Your kids will surely love this cool Elsa t-shirt from the Disney movie Frozen. Made from 100% cotton for comfortable fit. A perfect gift for Disney Frozen fans. Ideal for dressing up and pretend play. Official licensed merchandise. Suitable for kids aged 4-5 years. Official Disney Frozen colour your own. Colour: White. Once they're gone.they're gone. Bargain at only £9.49. Elsa from Frozen Snow Queen design with Silver Glitter. Girls Royal Blue T Shirt. Age 9-11 years.